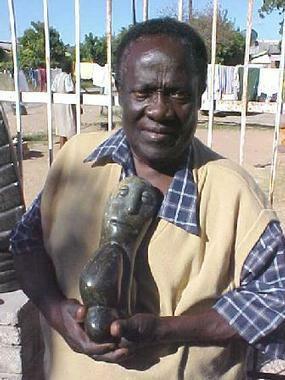 Fanizani Akuda, also known as Fanizani Phiri, was a member of the sculptural movement usually called "Shona sculpture" (see Shona art and Art of Zimbabwe), although he and some others of its recognised members were not ethnically Shona. He worked initially at the Tengenenge Sculpture Community, 150 km north of Harare near Guruve, which he joined in 1966. Fanizani died on 5 February 2011. Fanizani Akuda, an ethnic Chewa was born in 1932 in what was then Northern Rhodesia. He received no formal schooling and in 1949 he moved to Southern Rhodesia in search of work. This led to employment as a cotton picker, bricklayer, and basket weaver: by 1966 he was working as a farm manager. However, in terms of his later success as a sculptor in stone, the most significant move came in that year when he was offered work by Tom Blomefield, a white South-African-born farmer of tobacco whose farm at Tengenenge near Guruve had extensive deposits of serpentine stone suitable for carving. Fanizani was initially a quarryman but after a period living in the artists’ community he took up sculpting: finding this provided a worthwhile financial return, he became a full-time sculptor alongside other well-known figures such as Henry Munyaradzi. Akuda and his wife Erina had seven children. They had left Tengenenge in 1975 during the civil war, taking residence in Chitungwiza. After Zimbabwe’s independence in 1980, Tengenenge Sculpture Community re-established itself as a major sculpting centre but Fanizani did not return there. He continued to sculpt independently until his death in 2011. "His characters are tender and humorous, constantly smiling, with mysterious slit eyes. They are often formed in pairs or groups. To Fanizani, family represents a poetic world, moving in its simplicity and its tenderness." Joosten, Ben. Sculptors from Zimbabwe: the first generation. Dodewaard, Netherlands: Galerie de Strang, 2001. 400pp.